Everyday I go to a website, Today in Canadian History, to see what happened in this country on that day. On July 14, I was visiting the site and saw that on that date in 1896 Jerry Potts had died. Who was Jerry Potts? I have read a few books on settling the Canadian West and Jerry Potts name seems to be everywhere. So I decided it was time I found a book about this amazing character and was happy to come up with Bear Child: The Life and Times of Jerry Potts by Rodger D. Touchie. The West was a lawless domain when Jerry Potts was born into the Upper Missouri fur trade in 1838. The son of a Scottish father and a Blood mother, he was given the name Bear Child by his Blood tribe for his bravery and tenacity while he was still a teen. 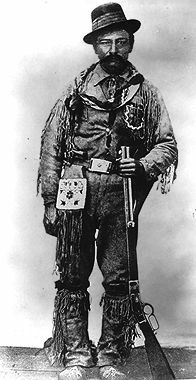 In 1874, when the North West Mounted Police first marched west and sat lost and starving near the Canada-U.S. border, it was Potts who led them to shelter. Over the next 22 years he played a critical role in the peaceful settlement of the Canadian West. Bear Child: The Life and Times of Jerry Potts tells the story of this legendary character who personifies the turmoil of the frontier in two countries, the clash of two cultures he could call his own, and the strikingly different approaches of two expanding nations as they encroached upon the land of the buffalo and the nomadic tribes of the western Plains. It was a fascinating and entertaining read. Very interesting was how the U.S. and Canada took different approaches to settling the west. Canada took the view of peaceful settlement and working with the various Indian tribes, while the U.S. was bent on extermination. Jerry Potts was in the middle of it all. "When a small group of Bloods and Peigans entered the fort, Macleod received them with all the pomp he could muster. Potts was summoned to listen to the extended oratory while Mcleod waited for an interpretation. Unfamiliar with the dramatic gestures and expressions before him, the colonel could only hope that the demands were not unreasonable. Finally the speech ended, and Macleod turned to Potts. For one of the first but not the last time, he got the succinct Potts translation. 'Dey damn glad you're here'"
A man of few words but huge loyalty and great deeds. The Canadian west would be a very different place without Jerry Potts. His contribution is one which should be taught in our schools. I enjoyed this book from start to finish and highly recommend it to anyone who likes biographies or Canadian History. It is a lively read.